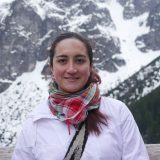 Home › › Pinzón Olga, Ms.
Modelling the dynamics of H2O and CO2 outgassing of comet 67P/Churyumov-Gerasimenko. After my Master at the University of Cologne, I was looking for a place to stay in Europe where I could do planetary science research and that’s how I found the Planetary Imaging Group at the University of Bern. There is life somewhere else in the Universe. Connect people from similar research fields.